Situated halfway between Nashville and Franklin is beautiful Midway mansion, a McGavock stronghold for one hundred and twenty-five years and one of the premier social clubs in the Brentwood area.The original McGavock home was built here by Lysander McGavock (1800-1855) around 1829, son of David (1763-1838) and Elizabeth McDowell McGavock. 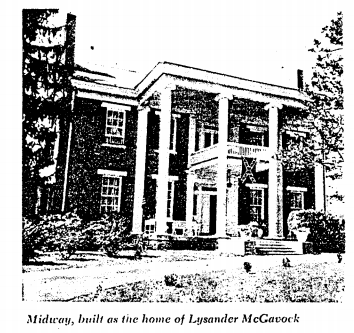 David McGavock and his family remained in Nashville when his brother came to Franklin and built Carnton Plantation. Midway was built in 1847 after the first home burned. Its walls rose from the slave-made brick on a foundation of limestone blocks and other materials salvaged from the ruins of the earlier house. During the war, Midway witnessed several sharp skirmishes and then sheltered the wounded of both sides. It served as headquarters for various commanding officers, and its grounds became the resting place for at least one Federal soldier. Livestock and food were constantly being hidden and retrieved during those times when raiding enemy parties would swoop down without warning. Valuables were buried or otherwise cleverly concealed, while the meat was saved by placing it under a false roof in the smokehouse. In 1948, McGavock Hayes accidentally discovered Captain Harris’s father’s U.S. Naval officer’s sword, his own Confederate sword, and a machete hidden in the attic at Midway. Trenches and breastworks remained in the meadows along creek banks until the golf green was developed in recent years. The beautiful family cemetery, enclosed by an iron fence, is north of the house. Here Lysander and Elizabeth McGavock rest with their six children. Here also are resting the bodies of Mr. and Mrs. Lysander Hayes and McGavock Hayes. In the mid-1950’s, the property was leased to the Brentwood Country Club. With its white columns gleaming through a vista of rolling meadows and shade trees, it is one of the most imposing sites to be found in an area abounding in elegant antebellum homes.